Ah, muffins. Those delectable, sweet, fluffy flavor domes shaped a lot like a cupcake and disguised as breakfast. Sometimes even with frosting or a glaze or some kind of streusel-y top that isn’t really a frosting or glaze but contains enough butter and sugar to make up for it. Yeah, those guys. Let me set one thing straight… I love me a muffin (also streusel). I really do. But what I don’t love is how I feel like I’ve just eaten dessert. If I want dessert, I’m going to go for it. I don’t believe in “skinny” desserts– sacrificing flavor/texture for less calories and/or sugar and leaving much to be desired in the way of a satisfying treat is not for me. However… When I can cut out calories/fat/sugar and leave flavor, a convincing texture, and an all-around tasty alternative, I’ll share it. 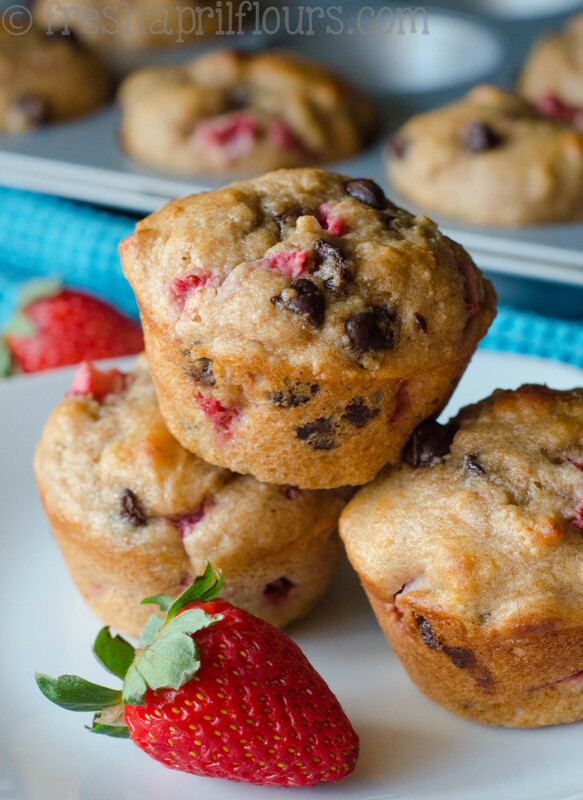 That’s exactly what these skinny strawberry chocolate chip muffins are all about. 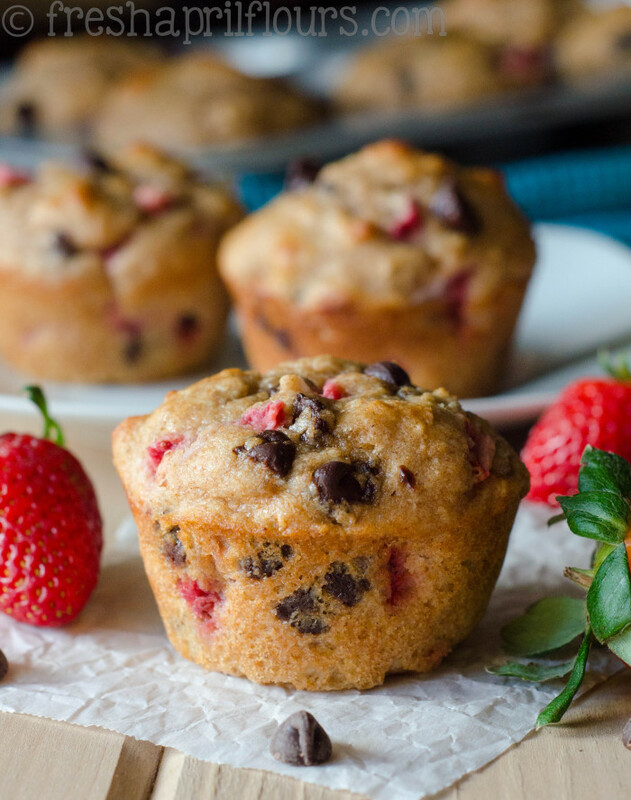 All the flavor you would expect from a muffin bursting with strawberries and smooth chocolate, but none of the guilt for eating said muffin for breakfast. This is a total win. 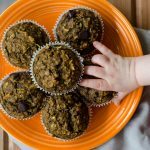 Because it’s still January, I promised I would keep my recipes on the healthier side, but I’m sure you will agree these muffins are good enough to whip up any time of the year. 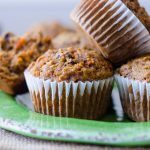 There is no oil or butter in these muffins, but rather unsweetened applesauce and a little Greek yogurt. These two ingredients alone pack so much moisture into each strawberry-studded bite that I’m sure you won’t even realize the oil and butter are missing. It’s embarrassing how excited I am to share my first “skinny” recipe ever. The base of these skinny muffins starts with whole wheat flour. Quite often, recipes that include whole wheat flour can end up dry, crumbly, and bland. There is none of that here! But feel free to use all-purpose or a combination of both flours– your preference. The most important part about mixing up these muffins is to be sure you don’t over mix the batter. Over mixing batter develops the gluten in the flour too much, resulting in a tough crumb. We want to keep the crumb nice and soft, so easy does it when you add your wet ingredients to your dry ones and then again when folding in the chopped strawberries and chocolate chips. Speaking of chocolate chips… I used dark ones, but feel free to use semi-sweet, milk, or even white… And mini if you prefer them over the regular size ones! I think my favorite thing about these muffins is that their base can be a pretty standard start for any kind of skinny muffin you can think of… But no worries, if you can’t think of any, I’ll be sure to help you out, because now that I’ve discovered the perfect skinny ingredients that produce the perfect full-figure flavor, I will be skinnifying all kinds of mouthwatering flavor combos. I may never make a cupcake-muffin ever again! 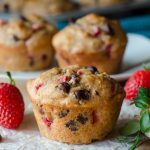 A short list of ingredients, nothing out of the ordinary, no mixer required, and muffins that are ready to eat in under a half an hour that you can feel great about? And that taste great on top of all of that? I mean, what are you waiting for?! Get to chopping up those strawberries! 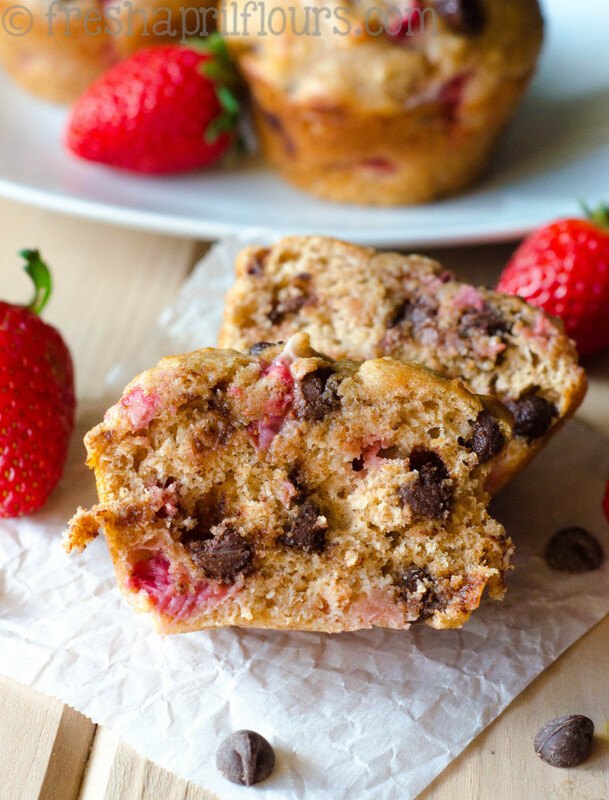 Chocolate chip muffins bursting with fresh strawberries. No oil, no butter, but no sacrifice of flavor! Preheat oven to 375ºF degrees. Spray a cupcake/muffin pan generously with nonstick cooking spray. Do not use liners. Set aside. In a large bowl, toss together the flour, baking powder, baking soda, and salt. Set aside. 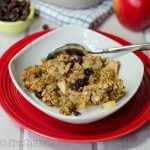 In a separate medium bowl, whisk together sugar, unsweetened applesauce, Greek yogurt, and vanilla extract until smooth. Whisk in the egg until fully incorporated. Add the wet ingredients to the dry ingredients until just combined-- do not over mix batter. 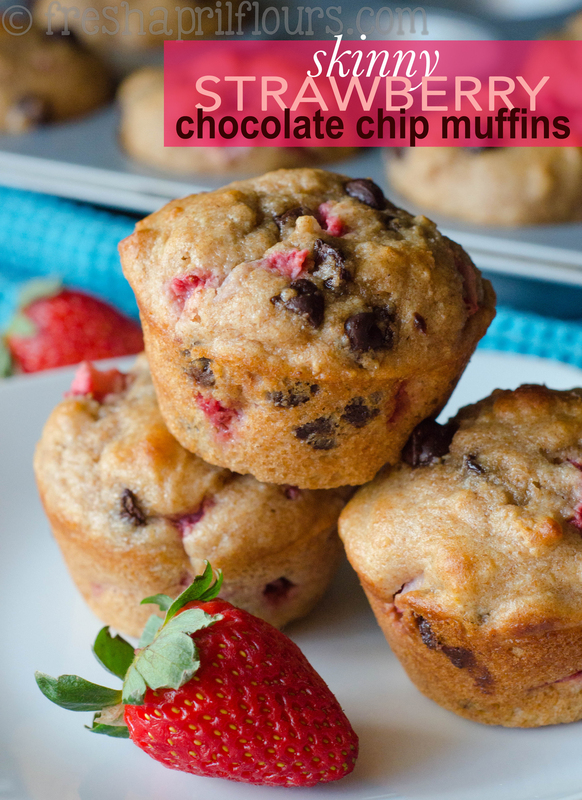 Fold in the diced strawberries and chocolate chips. Divide the batter evenly between 10 muffin cups (using an ice cream scoop with a trigger makes this easier). Bake for 14-16 minutes or until muffins just turn lightly golden on the top and a toothpick inserted in the middle comes out clean. 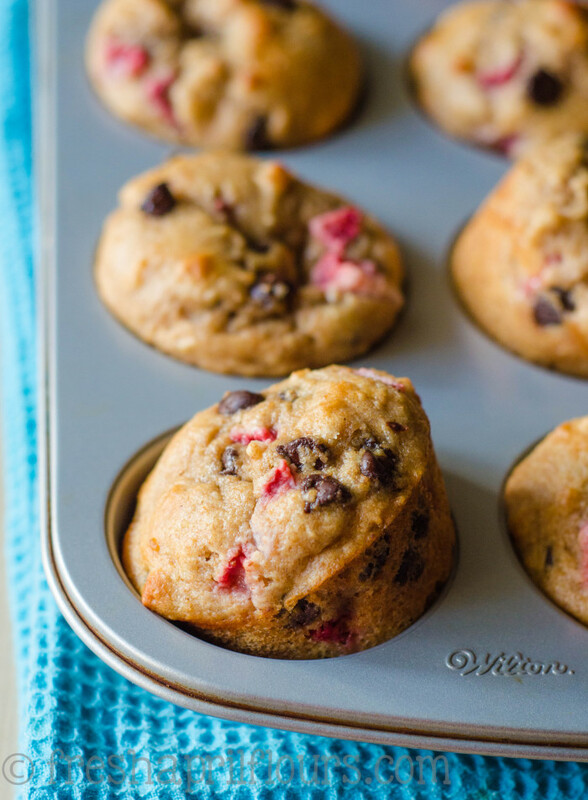 Allow muffins to cool in pan 5-10 minutes before transferring to wire rack to cool completely. Muffins will stay fresh in an airtight container at room temperature up to one week. Muffins freeze well, up to 2 months. Thaw in microwave for 45-60 seconds before eating. 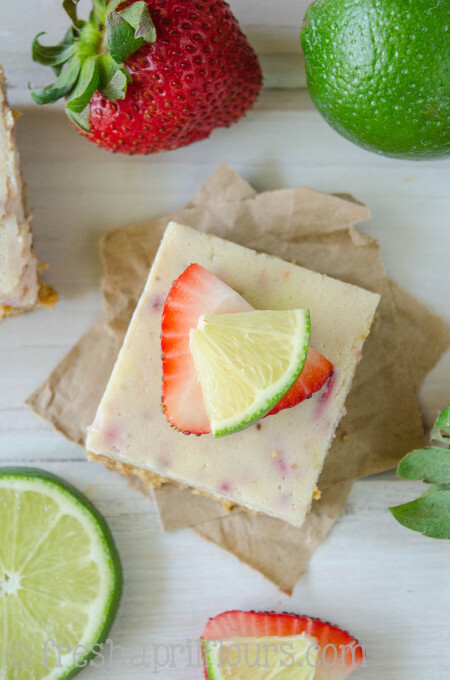 If you’re into strawberries but don’t mind that they’re not skinny, you should check out my Strawberry Margarita Squares next! I totally agree!! Most of the time, skinny desserts have almost the same calories, maybe just a little less processed ingredients and more “wholesome” ingredients – but instead of being satisfied in the end – you end up wanting your “desired” dessert more than ever! Haha 🙂 These muffins look sooo yummy! I can’t wait to try them! EXACTLY what I’m talking about! I assure you, though, that these do not leave you unsatisfied one bit! 🙂 Thanks for stopping by! 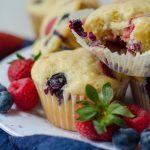 Love how delicious these muffins are.. and how healthy they are too! 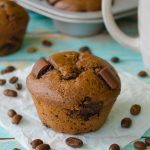 Another winning muffin flavour combination! I hope your meet up went well! I’m with you, I don’t want skinny chocolate cake or low fat cheesecake (why would you bother) if they are going to taste like cardboard – they are treats for a reason, and I want to indulge when I choose to and enjoy the flavour! 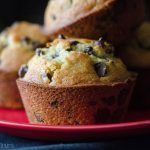 But, when it comes to muffins that I would eat for morning tea or as a pre-run snack, I don’t mind cutting out fat and sugar if I can keep the same texture and flavour. I also love that there is chocolate in these healthy treats 🙂 Can’t wait to try them! Lynn, my son is going to make these for his 4-H project for cooking at fair. However, there are not nutritionals…can you please direct me to where I might find them? Hi, Tanya! If you Google any nutritional information calculator, you will be able to input the exact ingredients you use. These look amazing Lynn! I love a good muffin but they are often so high in calories. This skinny version looks fabulous, they still look lovely and soft and with strawberries and chocolate? Delicious! Yes, exactly! Don’t have to feel guilty about these guys, for sure!